I was told that Norwegians are cold. 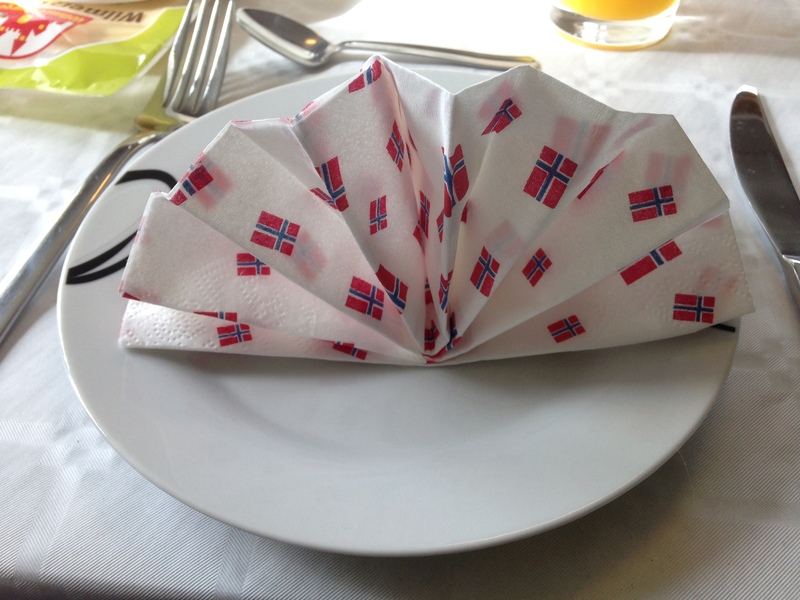 In preparation for coming here, the blogs, travel sites, and books warned of Norwegian reticence: everyone is polite, but it takes time to actually become friends. Be patient, the sources claimed, and eventually you will break through the Norwegian coolness. When I got here I found both the literal and figurative Norwegian temperature quite comfortable. Perhaps it is the introversion (like so many academics), but I find people who are overly eager to become friends a bit taxing. So the welcoming yet cautious social choreography of most Norwegians suited me quite well; it mirrors my own approach to friendship. Though it does mean that I have attended precious few social gatherings, and my time is almost up. Such is the trade-off. It has not been all books, though. 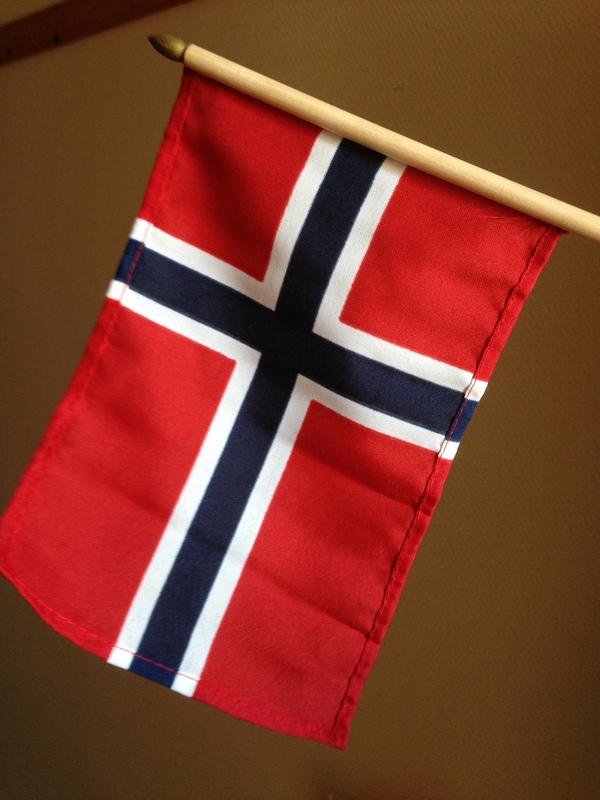 May 17th is the Norwegian national holiday, celebrating independence. 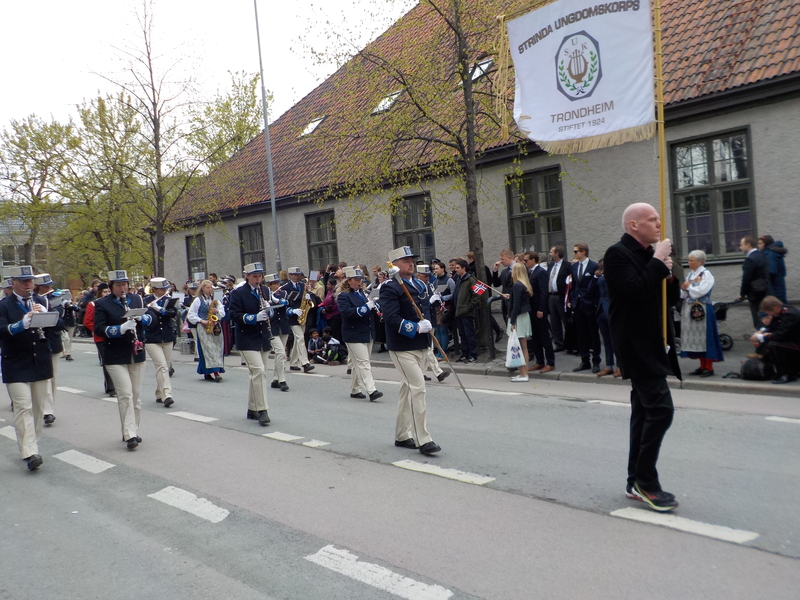 It is a day of fanfare, where every city in Norway has a parade. 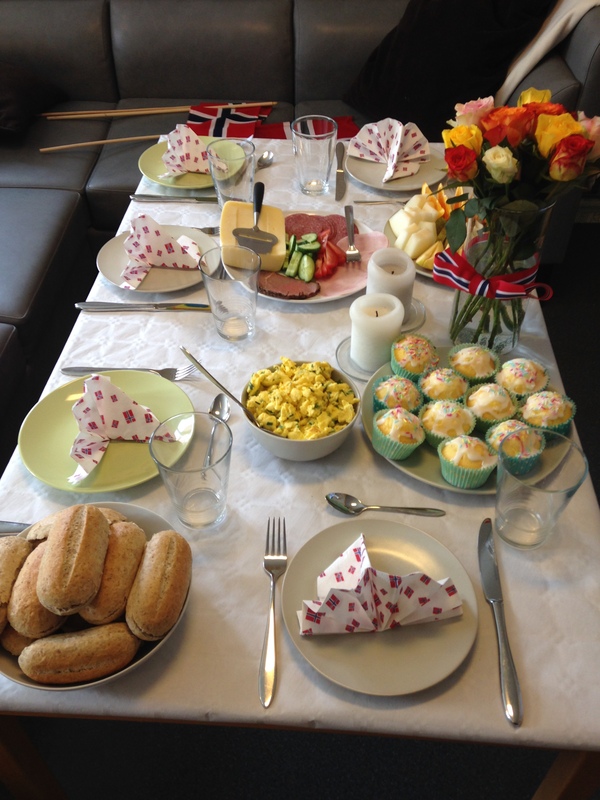 My flatmates organized a potluck breakfast on the day, preceding the march downtown. 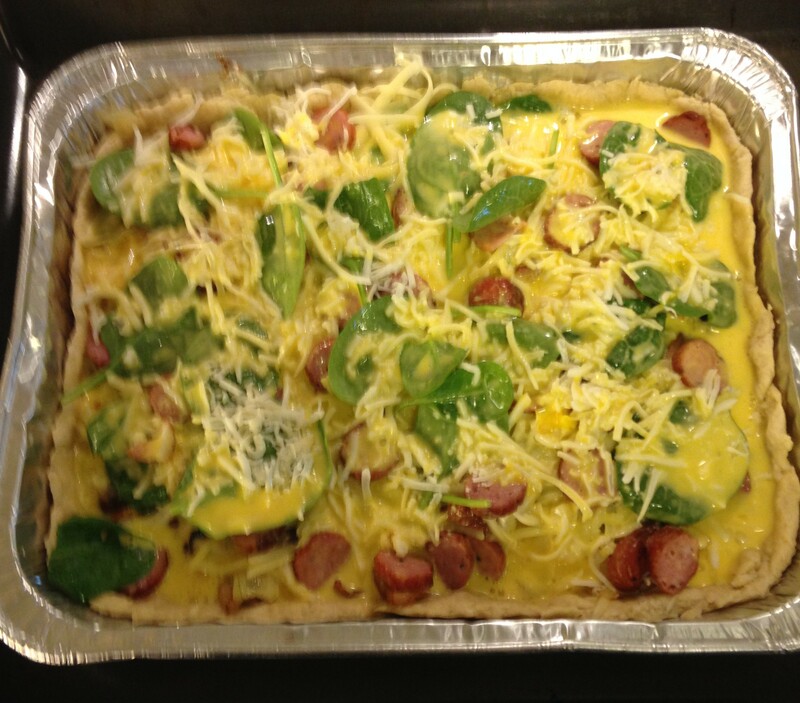 I volunteered to make quiche, to infuse some French-Canadian cuisine into the Norwegian festivities. 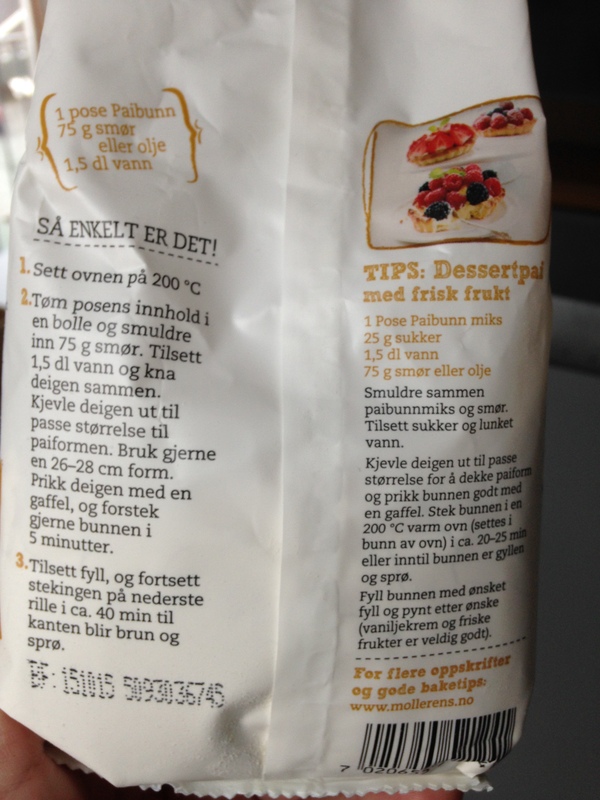 As with so many other times, I stumble across a language issue; how do you make the pie crust without English or French instructions? You type the entire text into an online translator, and secretly hope that the sentence translated as, “prick the bottom with a fork and reinforced happy bottom for 5 minutes” actually means something about naughty fun. It doesn’t, though. Such is the disappointment. Sausage, onion, mushroom, spinach, and gouda and mozzarella cheese, with cream and whipped eggs. It turned out pretty yummy. 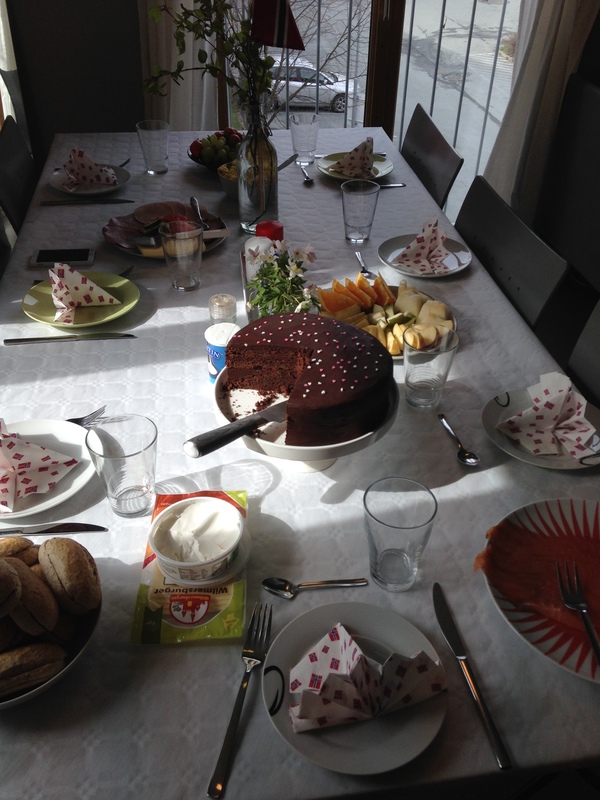 My flatmates lay out an impressive table, complete with folded napkins. 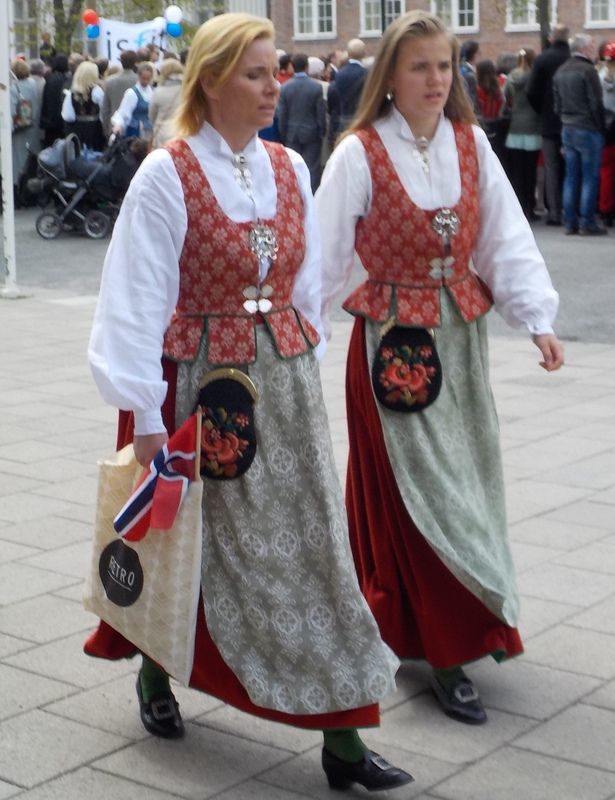 The bunad, meaning ‘clothing’, is a fairly recent development in Norwegian culture. The more ‘authentic’ bunads are modelled off old folk attire worn in certain regions that developed over the centuries. 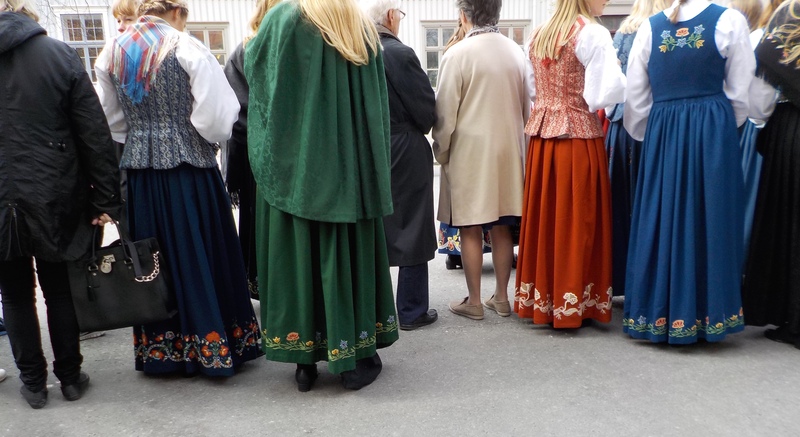 Even though old folk wear (commonly called ‘folk costumes’ in Norway) evolved because of daily life, regional traditions and celebrations, the bunad only borrows from the more festive forms of traditional folk clothing. 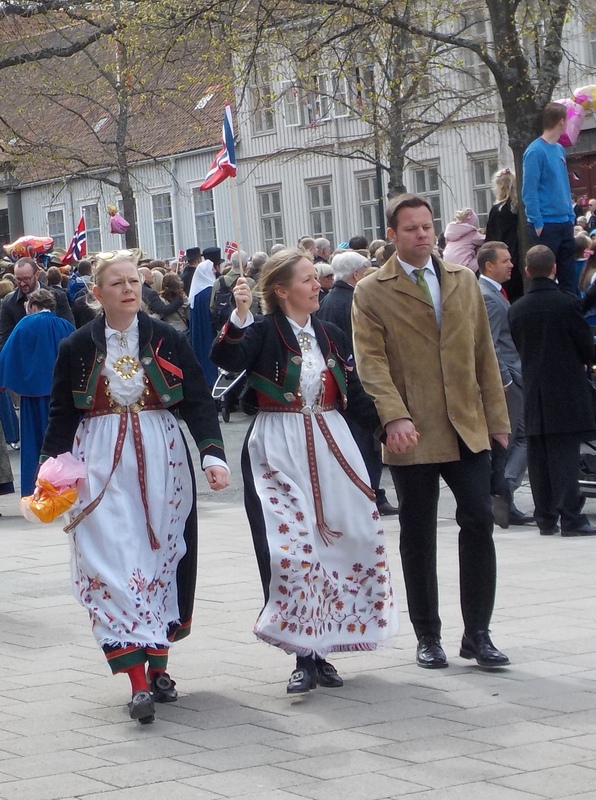 Category 1 – a bunad that represents a ‘final’ link’ in the development of a folk costume. This is basically an original folk costume that has taken on the function of a bunad. 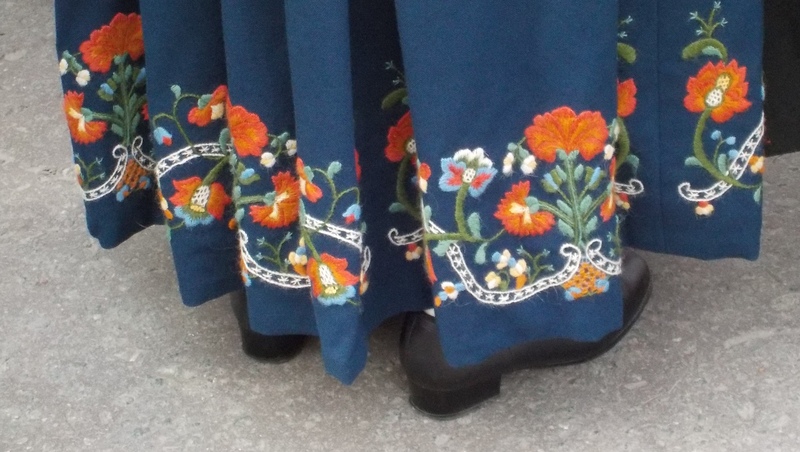 Category 2 – a bunad that has a background in a particular folk costume that is out of use but not forgotten. It is generally reconstructed from first-hand knowledge. 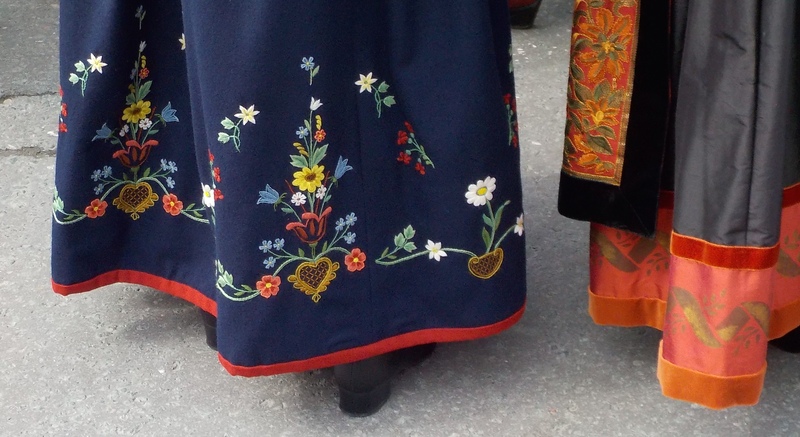 Category 3 – a bunad that has been reconstructed from preserved folk garments which reflect the actually time and region of the piece. Pictures and writings are used as sources in reconstruction. 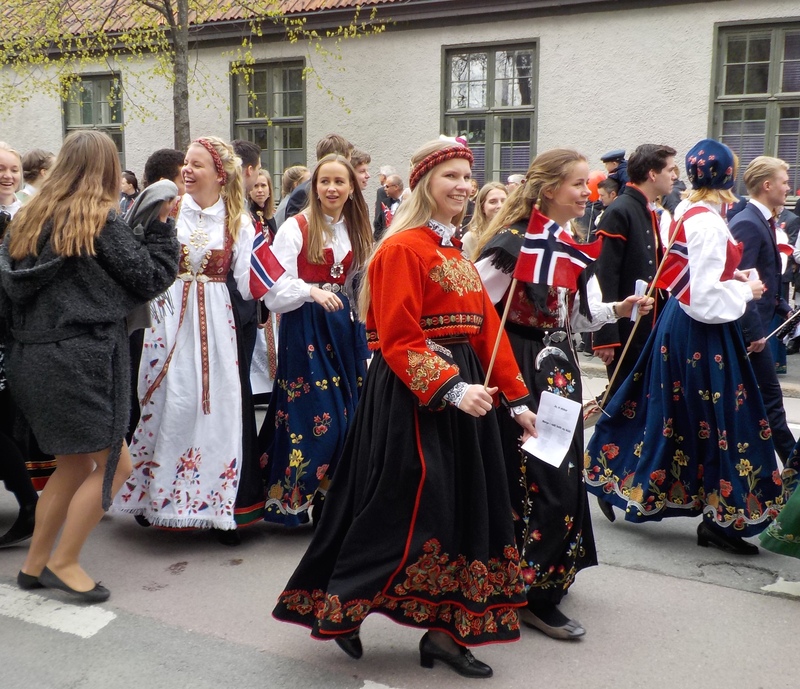 Category 4 – a bunad that has been made based on random and incomplete folk material. Missing peices have been designed to match the style of the materials. Category 5 – a bunad that has been completely or partically ‘freely composed’. 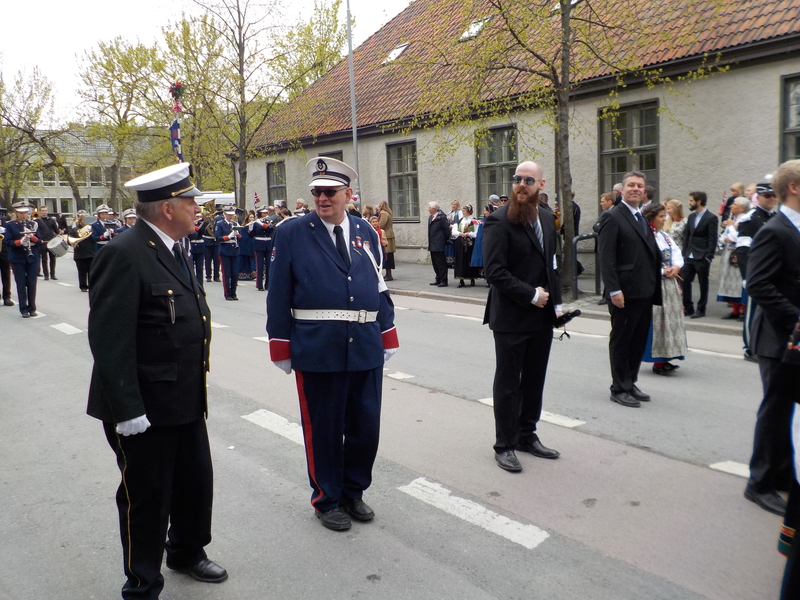 It was the 1800s bunad movement that has given these types of bunad their status. 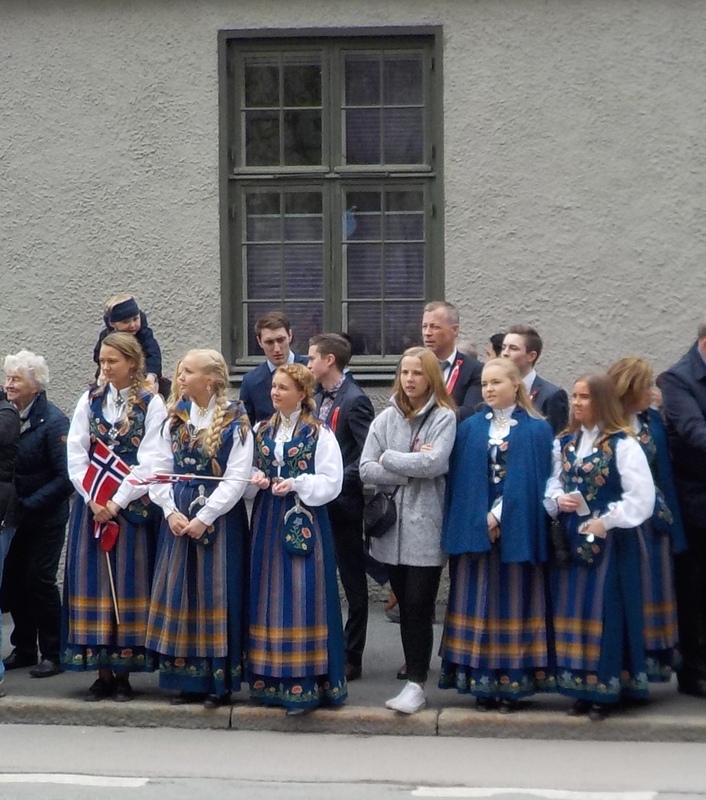 New ‘bunads’ that are being designed every year, must go through the strict judgement process of the National Bunad Council in order to be classified as a proper ‘bunad’. The council is very strict in making sure new additions follow closely the traditions and history of the area. Because of this, many designs today, even though they have the same function as a bunad, generally don’t make the cut and thus can not be called ‘bunads’. They recieve the name ‘festive costumes’ instead. This is a flower detail of one the guests at brunch. After the feast, I went downtown for the parade. 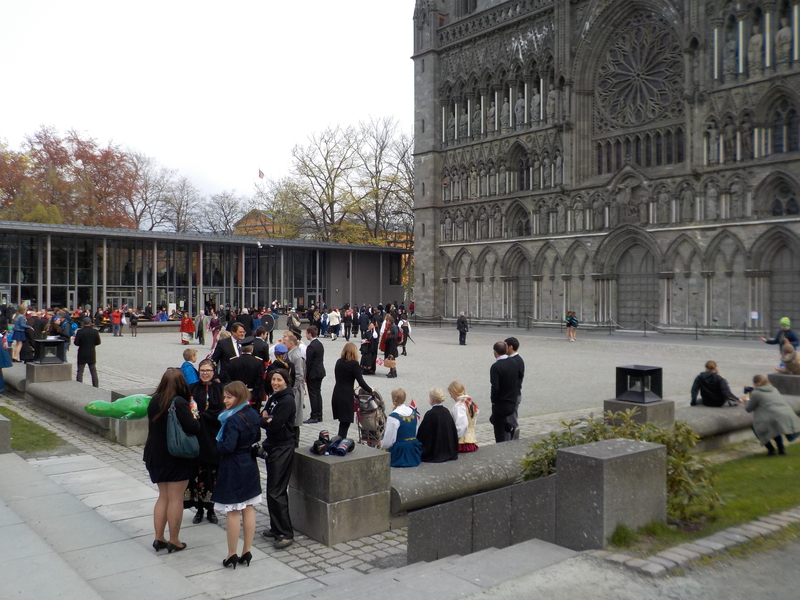 People gathered in front of the Nidaros cathedral, preparing for the start. I walk through the crowd, and find a spot somewhere down the street. 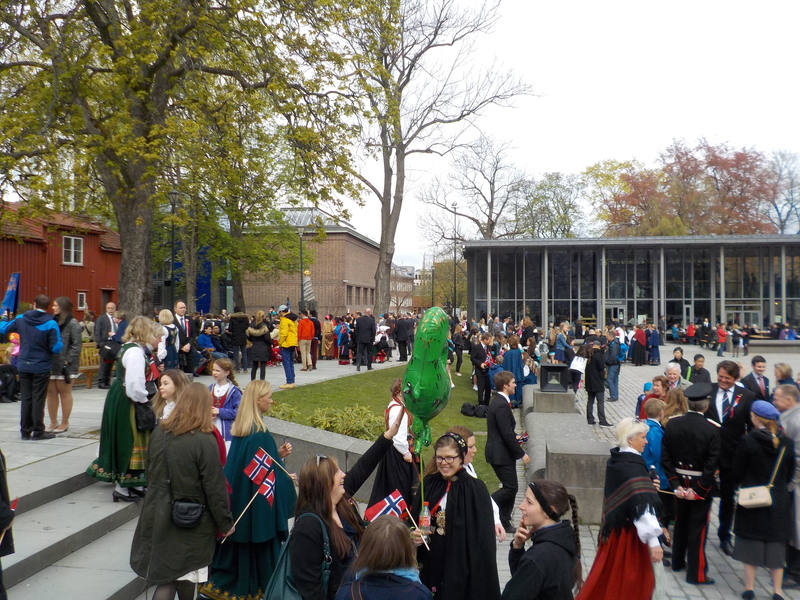 It is packed, and everyone is either dressed in traditional costume or their Sunday best. I take a thousand pictures of intricate hems. Bet that girl in the middle is regretting not playing along. 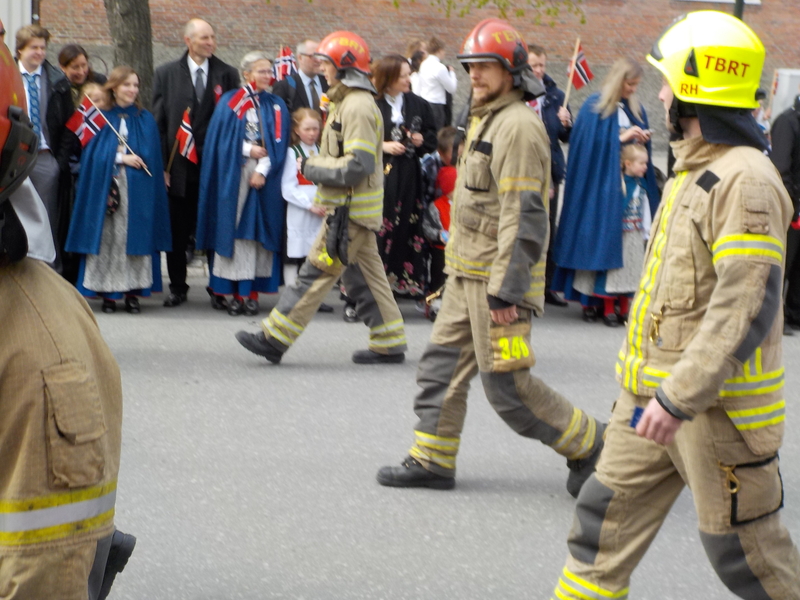 Within the procession itself, various groups were represented: schools, dance clubs, sports teams, law enforcement, and cultural centres. The traditional costume of heart-throbs everywhere. And what parade would be complete without a knight? 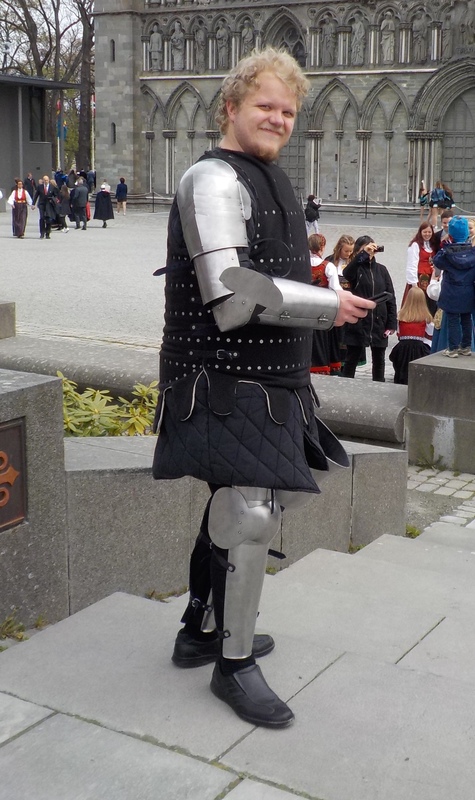 All medieval knights have the iPhone 6. Blackberries are for wimps. 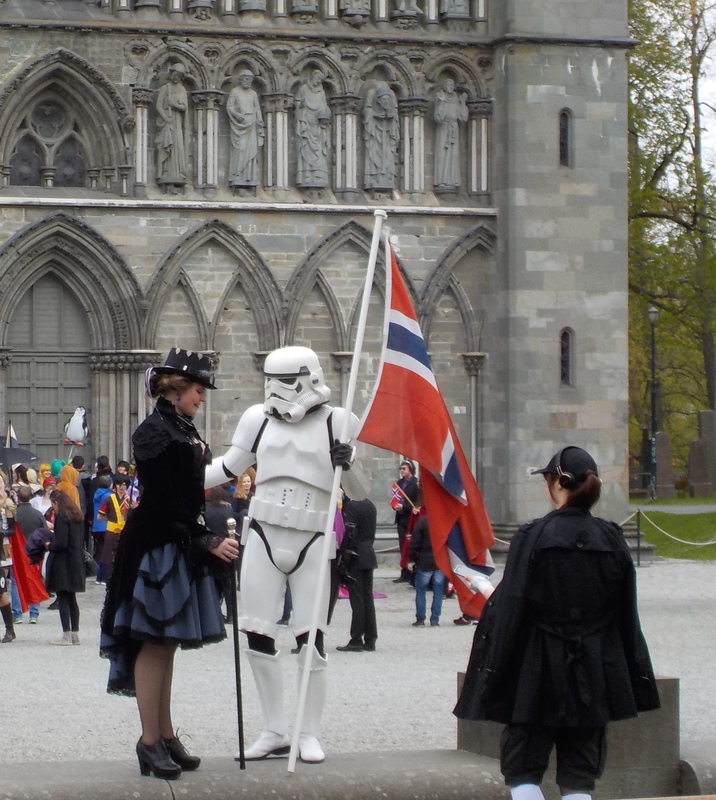 And of course, a stormtrooper and steampunk girl. 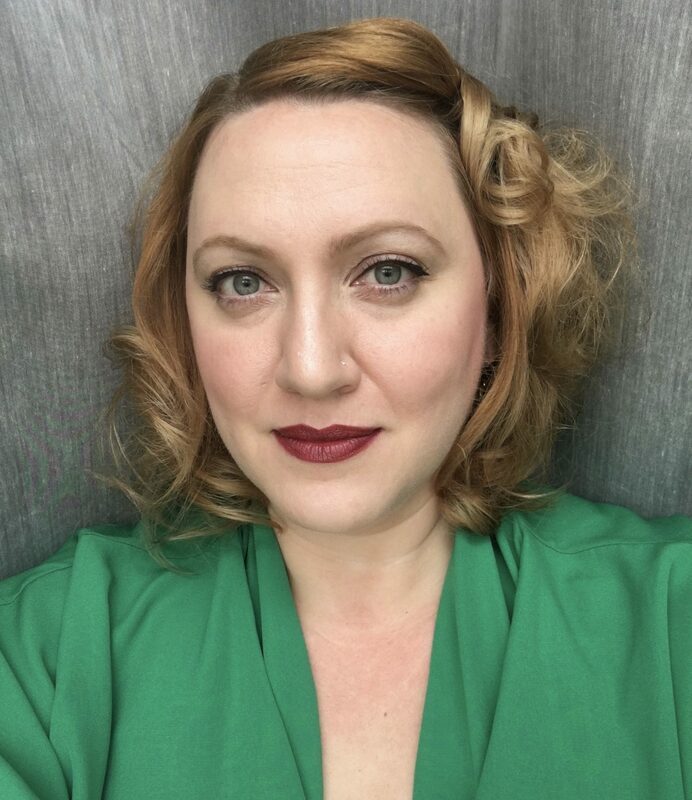 One of my side interests, is to research women’s folk history via the textiles, as sewing, embroidery, crochet, and knitting are often skills passed through the female line. The songs sung and stories told reveal a particular, untold history of women’s work. 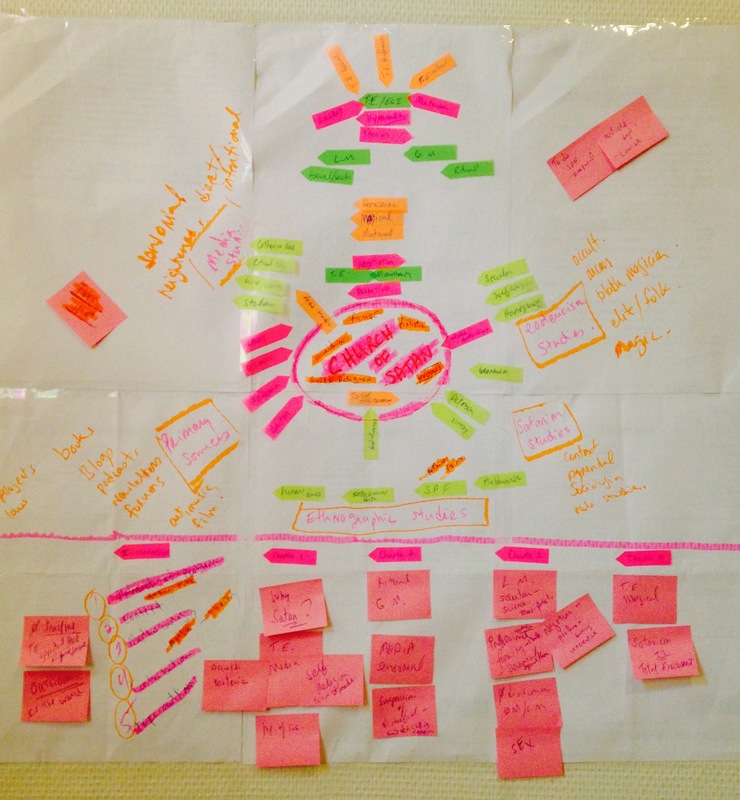 Work that then contributes to the history of a nation and how it understands itself. It will all have to wait until after the dissertation, of course, as with so many other things. Hobbies and interests and even friendships have fallen by the wayside in pursuit of this degree. Such is the price. You don’t owe prettiness to anyone. The visceral provocation of images has traditionally been suspect. David Morgan writes: “Images work their magic by a subtle and often irresistible effect on the body: provoking fear, envy, pride, desire, obsession, rage—all the strong feelings and passions that grip the chest or rise in the blood, creep over the flesh, well up as tears in the eyes” (2002, 96). He states that images “appeal to and rely on the body,” and that this embodied experience is what has lead “philosophers, teachers, moralists, clergy, and parents” to be suspicious of the image, as they can quickly unravel the dogma of moral authorities (ibid). Again, it is the provoked emotions that are questionable, and reflect the ostensible mind-body dichotomy; anything rooted in the body, emotions, and uncontrollable reactions are suspect. As Morgan writes: “Vision is a carnal way of knowing” (2002, 97). Satanists recognize this “carnal way of knowing” and maximize on the primal experience of the image. The image of our object of hate or desire compels an emotional, immediate reaction, wherein one re-experiences those feelings with simply a gaze. The idiosyncratic depictions collapse time and space into the immediacy of the image-experience, the gaze-feeling. To be incited and roused is to have a successful magical working. Not only personal images are used, as Satanists also adapt thematic ritual aesthetics. Examples are: primordial creatures of the Lovecraftian Cuthulu mythos; Bettie Page to evoke the playful burlesque; and Norse runes and narrative to conjure the fierce warrior. Satanic ritual imagery is thus a combination of the idiosyncratic and archetypal icons. LaVey, echoing threads of contemporary scholarship, laments how embodied experiences have historically been denounced. 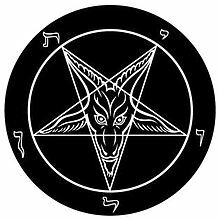 Satanists’ use of Satan reflects the popular and theological notion that the material image is lesser, “evil” even, than philosophical or intellectual pursuits. Satanists subvert this idea, and reinterpret the image-experience as a cathartic and powerful magical tool. LaVey, Anton Szandor. 2005 . The Satanic Bible. New York: Avon Books. Meyer, Birgit. 2013. “Material Mediations and Religious Practices of World-Making,” in Knut Lundby, ed. Religion Across Media: From Early Antiquity to Late Modernity. New York: Peter Lang, 1-19. Morgan, David. 2008. “Image,” in David Morgan, ed. Key Words in Religion, Media, and Culture. New York: Routledge, 96-110. Nemo, Magister. The Fire From Within: Volumn One. U.S.A.: CoS Emporium, 2007. 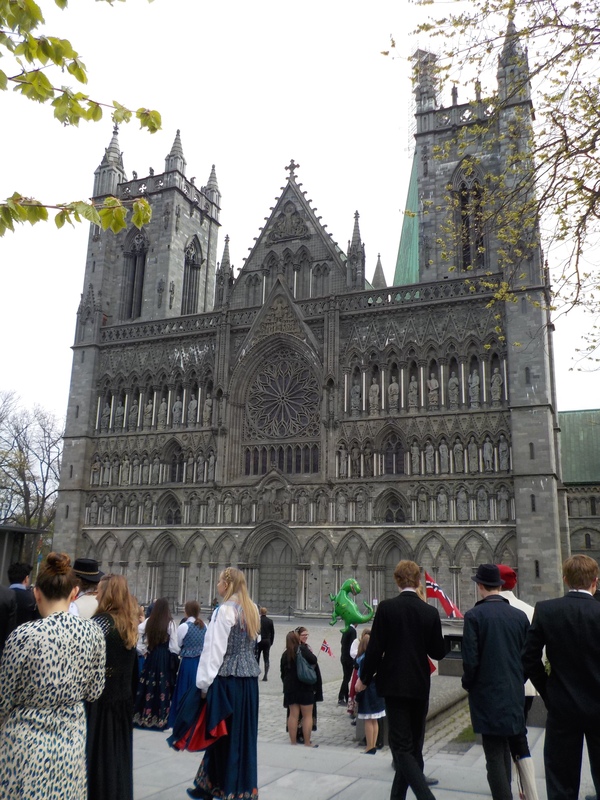 NTNU has a photo competition for international students (spring 2015), submitted by various exchange and visiting students. Many of them are pretty spectacular, and you can view the entire album on their Facebook profile (one of my dog-sledding pics is in the folder). 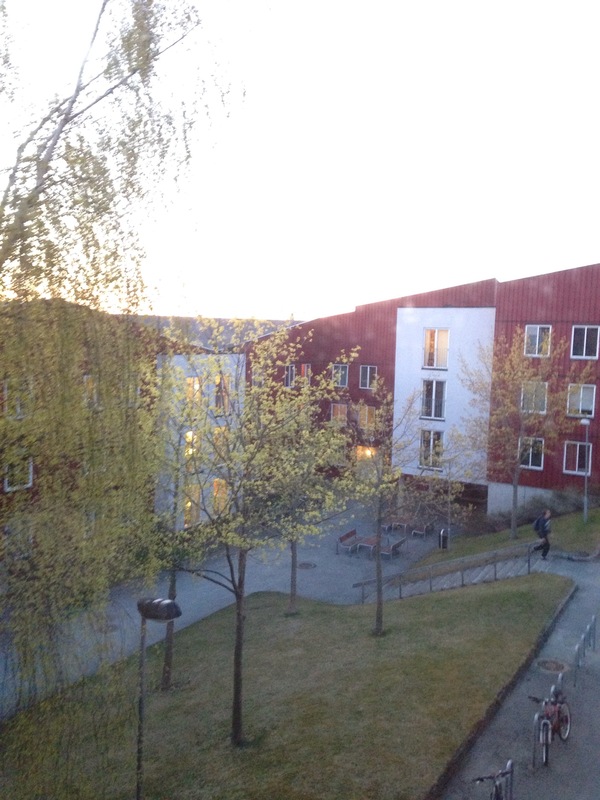 This was the light at 22:30 last night.